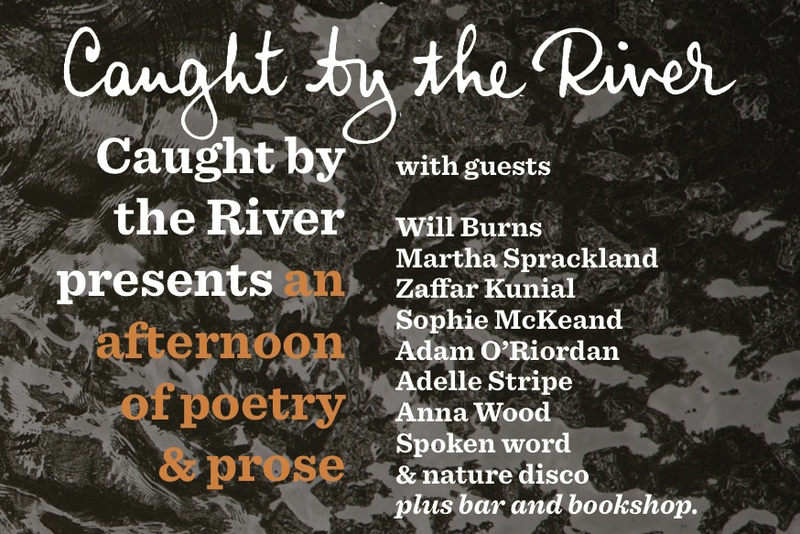 Caught by the River presents: an afternoon of spoken word & nature disco plus bar and bookshop. Will Burns is poet-in-residence for Caught by the River. A regular reader of his work at festivals from Port Eliot to Glastonbury, End of the Road to Festival No. 6, his marvellous debut pamphlet, published through the prestigious Faber New Poets scheme in 2014, was hailed for its ‘quiet intelligence and subtle ways of seeing’, for a voice that is ‘rough but still tender, solitary, ruminating’. His equally brilliant second pamphlet was published by Clutag in 2016. Zaffar Kunial’s poems are strikingly beautiful, highly self-possessed investigations into the intricacies of language. Zaffar was poet-in-residence for the Wordsworth Trust, placed third in the National Poetry Competition 2011 for his poem ‘Hill Speak’, and was one of four poets to take part in The Pity, a series of new poems commissioned and performed in response to the First World War. His debut pamphlet was published in 2014 through the Faber New Poets scheme. Sophie McKeand joined us on stage at The Good Life Experience in 2016, where she captivated the audience with her profound, mythological, musical poems that not only crossed borders but seemed to dismantle them entirely, collapsing time and space and merging visions of the past with narratives of the personal. Sophie is currently the Young People’s Laureate for Wales, and her most recent publication is Hanes, a hand-stitched letterpress pamphlet. Recognised with a Somerset Maugham Award for his debut collection of poems, In the Flesh, and gifted with a highly musical ear and an ability to pick sumptuous and exacting detail from wide, ambitious subjects, Adam O’Riordan is one of the most outstanding young poets writing today. A highly anticipated second book of poems, A Herring Famine, will appear in 2017, as will The Burning Ground, Adam’s debut collection of short stories. Martha Sprackland’s debut pamphlet, Glass As Broken Glass, is published in January 2017 with Rack Press. Martha was twice a winner of the Foyle Young Poets of the Year Award and received an Eric Gregory Award in 2014. Previously founder-editor of Cake magazine and assistant poetry editor for Faber, she is currently an idle larkabout (finishing a first collection) and, with Will Burns, is poet-in-residence for Caught by the River. Adelle Stripe’s third chapbook, the exceptional, shadowy Dark Corners of the Land, was in 2012 chosen as a Book of the Year by both 3:AM Magazine and the Scotsman. Her latest poetry project is Beyond the Silver Pit, a remarkable and meticulously researched exploration of her own family’s history in the fishing communities of the Hull coast, telling the story of the death at sea in 1894 of an ancestor, Matthew Mudd. A regular on Caught by the River, as well as a contributor to the Quietus and MOJO amongst other places, short story writer Anna Wood recently finished both a debut novel and a first play. As if that wasn’t dynamic enough, she is also currently midway through a creative writing PhD at Goldsmiths. She believes (hopes) that communes and cosmopolitanism are the future.